It is official! Even though it has been a well-known fact for over a year, at least at work, I am trading the corporate office for a home office. My resignation letter has been filed and I am two weeks away from a four-week vacation. I start my new position on April 1st! I'll still be working full time but will have flexibility with my schedule. It will require traveling about once or twice per month but it is to Old Town Alexandria, VA. How bad can that be? It is Slow Sunday Stitching over at Kathy’s Quilts. My project for today is a very special one. A dear friend from high school lost his Dad last year and his Mom is making him a memory quilt using his Dad’s blue jeans and shirts. He sent me a piece of denim and asked if I would make the ‘center’ block for the quilt. He wants the quilt to be a tribute to his Dad. If that isn’t enough pressure (LOL), his Mom is an expert HAND piecer and quilter. My block is machine pieced but I will hand stitch the applique’. 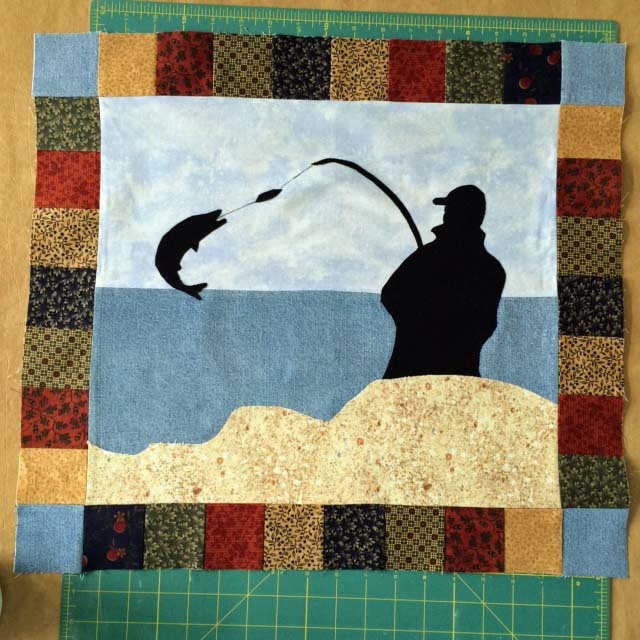 The design is one of the blocks from Kaaren Johnston's "Camp Wilderness" pattern. The water and cornerstones are from the denim I was given. I can't wait to see it in the finished quilt. Are you slow stitching today? Pop over to Kathy's to see what others are working on...always a lot of eye candy.